Inspect Immediately Packing Labels ensure packages get the necessary attention. • Warn consignees against possibilities of damage. 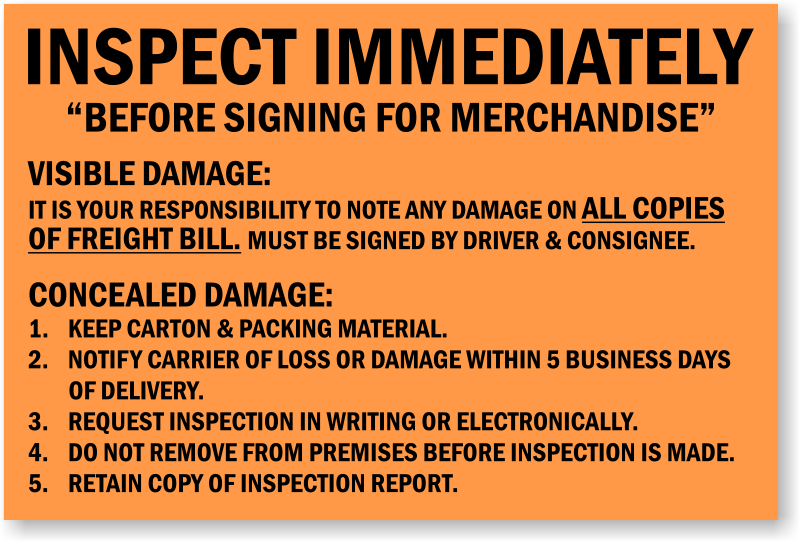 Alert them to proper procedure of receiving the package for quality check and later claims. • Label comes with aggressive adhesive and sticks easily to corrugated cartons and shrink wraps. • Peel off liners help remove labels easily. • Use a dispenser to better organize labels for easy application. • Fluorescent labels get noticed faster. Made from 50# colored paper and 50# liner so they will go through virtually any printer. • Paper labels are economical for short term, temporary and dry indoor applications. Do not expose to moisture or outdoor environments. • Write on this paper label material using a pencil, ball-point pen, or marker. Labels can be fed through most inkjet and laser printers for customization. • The general purpose permanent adhesive is made from clear acrylic and is adaptable to many surfaces. • The minimum application temperature is 50°F and the service range is from -20°F to 175°F. • Labels are digitally printed in high resolution using toner inks.